It works! You really can print on fabric with a regular printer. You just need to iron a piece of fabric to a piece of freezer paper. There are lots of tutorials for doing it. I used this one: Instructables - Inkjet Printing on Fabric . I used clipart from KPM Doodles and added the words. My January Giveaway is digital clipart (two sets of your choice) from KPM Doodles. I will also send the winner the two pieces of fabric printed and ready to make this tiny little pillow (not sewn or stuffed). First of all, here is the document if you want to print one for yourself. You are Loved printable. (The page view will be portrait, my example was landscape). This printable is only for personal use. If you want to share it, please link to this post. The fabric I printed on was $3.99 /yard at IKEA. 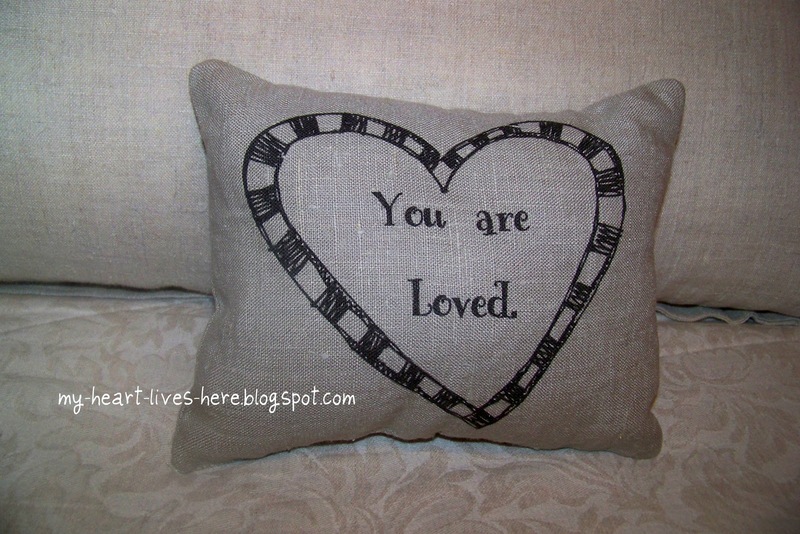 Since this is purely a decorative pillow, I did not take any extra steps to make the dye set. THIS PILLOW IS NOT INTENDED TO BE WASHED. 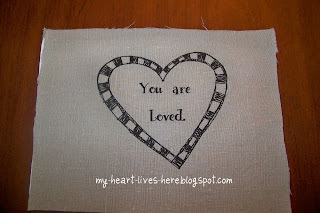 (1) Follow this blog (my-heart-lives-here-blogspot.com) and leave a comment on this post. (2) In addition to following my blog, go to KPM Doodles, choose your two favorite clipart designs, and write a comment here telling us which are your favorites. I will use a random number generator to choose a winner from the comment entries on January 23, 2012. Please be sure to include your email address in the form when you comment so that I can contact the winner. Very sweet! Great graphic - I really like scribble-looking stuff. I love printing on fabric - though last week a small spring came out hanging off one of my fabric sheets - oops! Printer still seems to be working, though! The the job you did with this pillow! So creative! Thanks for sharing this! This is so cute! I'd use this pillow all year! Thank you for sharing! I'm your newest fan. Please stop by bellanest.blogspot.com if you get a chance. Adorable! 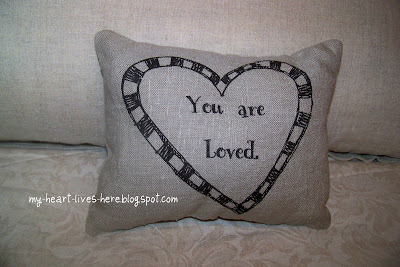 I love little pillows like this. What an awesome gift it would make. Super cute! I want to try this idea now. I am following your blog! Please check out mine if you get a minute! i like the snowmen and bright heart attack prints. How fun and creative. I had no idea you could print on fabric with freezer paper! Thanks for linking your idea up to my Valentine Link Party! I appreciate you taking the time to do that! I LOVE this idea! I've been dreaming about a Silhouette Cameo and had no idea I could print on fabric using my own printer! I am a new follower. I love allll doodle type cliparts. Very hard to pick just two hehe They are all great. I like the Valentine Sweets and the Love Shack. The pillow is really really sweet! Beautiful! Thanks for linking up to Scrappy 2nd Saturdays in January.